Background: The majority of breast cancer patients in Jordan are diagnosed at a young age and present with metastatic or locally advanced disease. The National Surgical Adjuvant Breast and Bowel Project Protocol B27 (NSABP-B27) (four cycles of adriamycin and cyclophosphamide [AC] followed by four cycles of docetaxel) is a standard neoadjuvant regimen in our institution. In this study, we report the efficacy of adding trastuzumab to docetaxel in this regimen for high-risk human epidermal growth factor receptor 2 (HER2)-positive early-stage disease. Patients and methods: Consecutive HER2-positive breast cancer patients treated with this regimen were included. Treatment was given at standard doses and schedules as reported in NSABP-B27. Trastuzumab was given with docetaxel and then continued for 1 year. Results: A total of 121 patients (mean age 45.4 years) were included. The majority had high-risk features including large tumor size, positive axillary lymph nodes, and grade III disease. Three patients did not complete the planned cycles of AC due to a lack of response. Eight (6.6%) patients missed at least one cycle of docetaxel. Following neoadjuvant therapy, 119 patients underwent surgery, of whom 59 (49.6%) patients achieved pathological complete response. The response was higher in node-negative patients (64.0 vs 45.7%; P=0.03) and in hormone receptor-negative disease patients (69.7 vs 41.9%; P=0.018). Breast-conserving surgery was performed in 21.5% of the patients. The median disease-free survival (DFS) for the whole group was not reached while the 3- and 5-year DFS rates were 84.2 and 74.1%, respectively. Conclusion: Trastuzumab added to the NSABP-B27 regimen is a unique combination. When used in high-risk patients, as in our study, outcomes similar to reported data were achieved without unexpected toxicities. The National Surgical Adjuvant Breast and Bowel Project Protocol B27 (NSABP-B27) trial6 utilized four cycles of adriamycin and cyclophosphamide (AC) with or without four cycles of docetaxel. Surgery was performed before or after docetaxel. Preoperative AC followed by docetaxel was associated with better clinical complete response rate (63.6%) compared to 40.1% (P=0.001) in the group that received AC alone. The overall clinical response rate (90.7 vs 85.5%; P=0.001), the pathological complete response (pCR) rate (26.1 vs 13.7%; P=0.001), and the proportion of patients with negative nodes at time of surgery (58.2 vs 50.8%; P=0.001) were also higher in the docetaxel arm.6 Similar results were also achieved in the Aberdeen trial, which utilized a different docetaxel-based neoadjuvant chemotherapy regimen.7 Similar results have been repeatedly demonstrated, thus establishing the role of taxanes in the neoadjuvant setting for breast cancer patients. The NSABP-B27 regimen is the standard neoadjuvant regimen at our institution.18 In this study, we report the efficacy and safety of adding trastuzumab to docetaxel following AC in the neoadjuvant therapy of patients with high-risk, HER2-positive, early-stage disease. Patients’ medical records and the hospital’s database were searched for all consecutive HER2-positive breast cancer patients treated at our institution between October 2008 and September 2015 using the neoadjuvant NSABP-B27 chemotherapy regimen along with trastuzumab. Patients included were those with primary breast cancer diagnosed by core needle biopsy. Clinical and pathological data collected included patients’ age, histopathological type and grade, lymphovascular invasion, hormone receptors and HER2 status, clinical tumor size, lymph nodes’ status, number of chemotherapy cycles received, type of surgery performed following chemotherapy, clinical and pathological responses, and disease status at last follow-up visit. Chemotherapy was given at the standard doses and schedules as originally reported in the NSABP-B27 study.6,19 Four cycles of AC (adriamycin [60 mg/m2] and cyclophosphamide [600 mg/m2]) followed by four cycles of docetaxel (100 mg/m2) were given; all were delivered on the first day of a 3-week cycle. Dexamethasone 8 mg was given orally every 12 hours, starting the day before docetaxel, and continued for a total of 3 days. In addition, patients received ondansetron at a dose of 8 mg every 12 hours for 3 days and granulocyte-colony stimulating factor support starting on day 2 of docetaxel for 5 days. Trastuzumab was given concomitantly with docetaxel at a dose of 8 mg/kg intravenously on the first day of the first treatment cycle, administered over 90 minutes. Subsequent doses were administered at a dose of 6 mg/kg over 30 minutes for three cycles and then continued for a total of one full year. Ejection fraction was followed by echocardiogram every 3 months. Disease responses were analyzed and reported based on NSABP-B27 criteria. pCR was defined as no evidence of invasive carcinoma in the breast at the time of surgery. Clinical tumor response was defined as complete if there was no palpable tumor in the breast or axillary lymph nodes at the time of surgery. Clinical partial response was defined as >50% clinical improvement in total tumor size while disease progression (PD) was defined as >50% increase in the size of the tumor. Tumors that did not meet the criteria for partial response or PD were considered to represent stable disease. All patients with either progressive or stable disease were considered nonresponders. Patients were seen in the medical oncology clinic prior to each cycle of chemotherapy for response evaluation and follow-up for any possible side effects or complications. Echocardiogram was done before starting adriamycin for high-risk patients and then prior to starting trastuzumab as a baseline and followed once every 12 weeks thereafter. Patient characteristics were tabulated and described. Descriptive statistics was performed for all variables. Results for continuous variables are expressed as median (interquartile range). Categorical variables are expressed as number (percentage). A significance level of P≤0.05 was used in the analysis. All statistical analyses were carried out using the SAS software (version 9.4; SAS Institute Inc., Cary, NC, USA). All procedures performed in studies involving human participants were in accordance with the ethical standards of the institutional and/or national research committee and with the 1964 Declaration of Helsinki and its later amendments or comparable ethical standards. Given the retrospective nature of our study and the absence of any patient identity, our Institutional Review Board (IRB) granted an exemption from full board review. Additionally, patients’ consent to review their medical records was not required by our IRB. A total of 137 patients diagnosed with early-stage or locally advanced, HER2-positive breast cancer treated with neoadjuvant chemotherapy with the NSABP-B27 regimen and trastuzumab were retrospectively analyzed. All patients were females, and the median age at diagnosis was 45 (range 24–78) years. Sixteen (11.7%) patients had inflammatory breast cancer and were excluded from further analysis. The majority of the patients had high-risk pathological features. The mean tumor size was 5.5 cm; 59 (48.8%) patients had T3 disease, 19 (15.7%) patients had T4 disease, and only two patients had T1 disease. Axillary lymph nodes were involved in 95 (78.5%) patients, and 69 (57.0%) patients had grade III disease. Hormone receptors (estrogen receptor and/or progesterone receptor) were positive in 88 (72.7%) patients; details of patient’s characteristics are summarized in Table 1. Notes: aThree patients had unknown tumor grade; btwo patients did not undergo surgery. Abbreviations: BCS, breast-conserving surgery; ER, estrogen receptor; PR, progesterone receptor. The planned four cycles of AC were completed and tolerated in all patients, but in three (2.5%) patients, treatment was stopped due to the lack of response. All planned AC cycles were given at full dose with no delay. Eight (6.6%) patients missed at least one cycle of docetaxel; three of them refused to complete the planned treatment, two of whom achieved complete clinical responses before completing planned docetaxel. Two patients died during treatment: the first was a diabetic patient who developed severe necrotizing fasciitis and the other died due to sudden pulmonary embolism. The remaining three patients had no significant clinical response, so chemotherapy was stopped by the treating physician. All patients received all planned concomitant trastuzumab with the docetaxel cycles with no significant adverse events. Following the four cycles of AC, 108 (89.3%) patients had clinical responses; 10 (8.3%) patients achieved a complete clinical response, and 98 (81.0%) patients had a partial response. Thirteen (10.7%) patients had stable disease. Clinical response was further improved following the docetaxel and trastuzumab treatment; complete clinical response documented at the end of the docetaxel treatment was achieved in 58 (47.9%) patients. Surgery was performed in 119 patients. In an intention to treat analysis, pCR, as defined by the original NSABP-B27 (ypT0N0 or ypTisN0) trial, was achieved in 59 (48.8%) patients. However, 27 (22.3%) patients had a residual noninvasive tumor (ductal carcinoma in situ [ypTis]). As such, 32 (26.4%) patients of the whole group had no invasive or noninvasive tumor in the breast or axillary lymph nodes (ypT0N0). For the remainder of the discussion, the original NSABP-B27 definition of pCR will be used. pCR (ypT0, Tis) was higher in hormone receptor-negative disease compared to hormone receptor-positive disease (23 [69.7%] of the 33 patients vs 36 [41.9%] of the 86 patients, respectively; P=0.018). 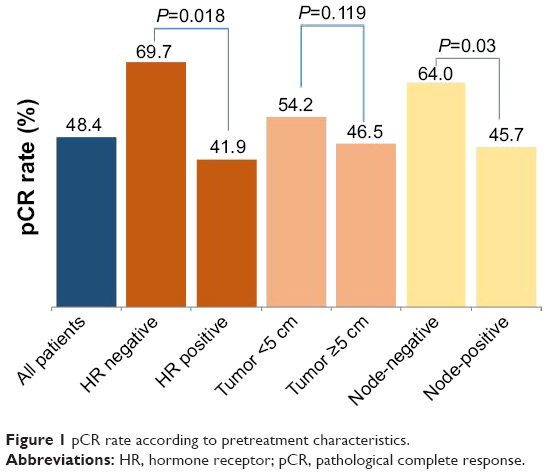 pCR was also slightly higher, although not statistically significant, in smaller tumors, achieved in 26 (54.2%) of the 48 patients with tumors <5.0 cm compared to 33 of the 71 patients (46.5%) with tumors ≥5.0 cm (P=0.119). Patients with no axillary lymph node involvement had a higher pCR rate, achieved in 16 (64.0%) of the 25 patients with negative axilla at diagnosis compared to 43 (45.7%) of the 94 patients with positive axilla at time of diagnosis (P=0.03) (Figure 1). Of the patients who underwent surgery, BCS was performed in 26 (21.8%) patients, 12 (46.2%) of whom were found to have a pCR. Figure 1 pCR rate according to pretreatment characteristics. Abbreviations: HR, hormone receptor; pCR, pathological complete response. The median DFS for the whole group was not reached. The 3- and 5-year DFS rates were 84.2 and 74.1%, respectively (Figure 2A). The 5-year DFS was 84.7% for those who achieved a pCR in both the breast and axilla (pT0N0) compared to 70.7% for those who did not (P=0.433, Figure 2B). Figure 2 (A) Disease-free survival for all patients. (B) Disease-free survival by pCR. Abbreviation: pCR, pathological complete response. Similarly, the median OS for the whole group was not reached. The 3- and 5-year OS rates were 87.2 and 83.4%, respectively (Figure 3A). Patients who achieved a pCR both in the breast and axilla had an improved 5-year survival rate (96.0%) compared to those who did not (80.0%). However, the difference was not statistically significant (P=0.220, Figure 3B). Figure 3 (A) Overall survival for all patients. (B) Overall survival by pCR. Cardiac toxicity was not reported in any of the 121 patients who received trastuzumab, and there were no additional toxicities related to trastuzumab use. To our knowledge, this is the first study to report on the efficacy and safety of trastuzumab when added to the neoadjuvant NSABP-B27 regimen. The use of trastuzumab in the neoadjuvant setting was assessed in many large clinical trials in patients with newly diagnosed locally advanced breast cancer. Our data showed that patients who achieved a pCR had better DFS and OS rates. This difference, however, was not statistically significant, likely due to the small number of patients included. Trastuzumab added to the NSABP-B27 regimen is a unique combination. Our patient population had higher risk and worse prognostic features than previously reported studies. Despite the limitations related to relatively small number of patients included and the retrospective nature of the study, the high pCR rate achieved in our patient population supports our conclusion that this treatment regimen is effective. Larger clinical trials are needed to confirm our findings. Makhoul I, Kiwan E. Neoadjuvant systemic treatment of breast cancer. J Surg Oncol. 2011;103(4):348–357. Kaufmann M, von Minckwitz G, Bear H, et al. Recommendations from an international expert panel on the use of neoadjuvant (primary) systemic treatment of operable breast cancer: new perspectives 2006. Ann Oncol. 2007;18(12):1927–1934. Buzdar A. Preoperative chemotherapy treatment of breast cancer – a review. Cancer. 2007;110(11):2394–2407. Specht J, Gralow J. Neoadjuvant chemotherapy for locally advanced breast cancer. Semin Radiat Oncol. 2009;19(4):222–228. Kim R, Osaki A, Toge T. Current and future roles of neoadjuvant chemotherapy in operable breast cancer. Clin Breast Cancer. 2005;6(3):223–232. Bear H, Anderson S, Smith R, et al. Sequential preoperative or postoperative docetaxel added to preoperative doxorubicin plus cyclophosphamide for operable breast cancer: national surgical adjuvant breast and bowel project protocol B-27. J Clin Oncol. 2006;24(13):2019–2027. Smith I, Heys S, Hutcheon A, et al. Neoadjuvant chemotherapy in breast cancer: significantly enhanced response with docetaxel. J Clin Oncol. 2002;20(6):1456–1466. Bargmann C, Hung M, Weinberg R. The neu oncogene encodes an epidermal growth factor receptor-related protein. Nature. 1986;319(6050):226–230. Ross J, Fletcher J, Linette G, et al. The HER-2/neu gene and protein in breast cancer 2003: biomarker and target of therapy. Oncologist. 2003;8(4):307–325. Sahin A. Biologic and clinical significance of HER-2/neu (cerbB-2) in breast cancer. Adv Anat Pathol. 2000;7(3):158–166. Tsuda H. Prognostic and predictive value of c-erbB-2 (HER-2/neu) gene amplification in human breast cancer. Breast Cancer. 2001;8(1):38–44. Gianni L, Eiermann W, Semiglazov V, et al. Neoadjuvant chemotherapy with trastuzumab followed by adjuvant trastuzumab versus neoadjuvant chemotherapy alone, in patients with HER2-positive locally advanced breast cancer (the NOAH trial): a randomised controlled superiority trial with a parallel HER2-negative cohort. Lancet. 2010;375(9712):377–384. Gianni L, Eiermann W, Semiglazov V, et al. Neoadjuvant and adjuvant trastuzumab in patients with HER2-positive locally advanced breast cancer (NOAH): follow-up of a randomised controlled superiority trial with a parallel HER2-negative cohort. Lancet Oncol. 2014;15(6):640–647. Untch M, Fasching P, Konecny G, et al. Pathologic complete response after neoadjuvant chemotherapy plus trastuzumab predicts favorable survival in human epidermal growth factor receptor 2-overexpressing breast cancer: results from the TECHNO trial of the AGO and GBG study groups. J Clin Oncol. 2011;29(25):3351–3357. von Minckwitz G, Untch M, Blohmer J, et al. Definition and impact of pathologic complete response on prognosis after neoadjuvant chemotherapy in various intrinsic breast cancer subtypes. J Clin Oncol. 2012;30(15):1796–1804. Esserman L, Berry D, DeMichele A, et al. Pathologic complete response predicts recurrence-free survival more effectively by cancer subset: results from the I-SPY 1 TRIAL-CALGB 150007/150012, ACRIN 6657. J Clin Oncol. 2012;30(26):3242–3249. Cortazar P, Zhang L, Untch M, et al. Pathological complete response and long-term clinical benefit in breast cancer: the CTNeoBC pooled analysis. Lancet. 2014;384(9938):164–172. Abdel-Razeq H, Marei L, Saadeh S, et al. From clinical trials to clinical practice: outcome of NSABP-B27 neoadjuvant chemotherapy regimen for high-risk early-stage breast cancer. Breast Cancer Res Treat. 2017;29(26):3351–3357. Bear H, Anderson S, Brown A, et al; National Surgical Adjuvant Breast and Bowel Project Protocol B-27. 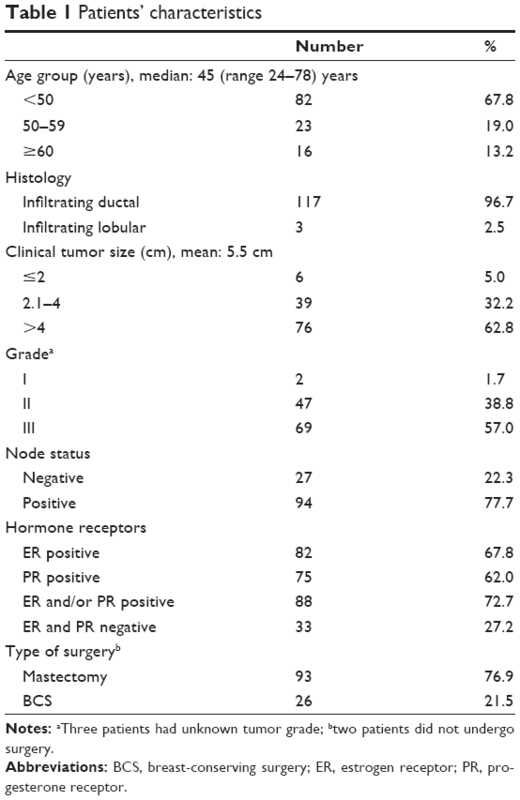 The effect on tumor response of adding sequential preoperative docetaxel to preoperative doxorubicin and cyclophosphamide: preliminary results from national surgical adjuvant breast and bowel project protocol B-27. J Clin Oncol. 2003;21(22):4165–4174. Goss P, Ingle J, Martino S, et al. Randomized trial of letrozole following tamoxifen as extended adjuvant therapy in receptor-positive breast cancer: updated findings from NCIC CTG MA.17. J Natl Cancer Inst. 2005;97(17):1262–1271. Untch M, Rezai M, Loibl S, et al. Neoadjuvant treatment with trastuzumab in HER2-positive breast cancer: results from the GeparQuattro study. J Clin Oncol. 2010;28(12):2024–2031.